The Big Guy has stepped in it Big Time and from what I am hearing from friends in the African American Community, Taylor’s recent deceptive campaign mailer, shown here, will not just hurt him in the primary election but will impact their willingness to support him actively in the General, were he to win. 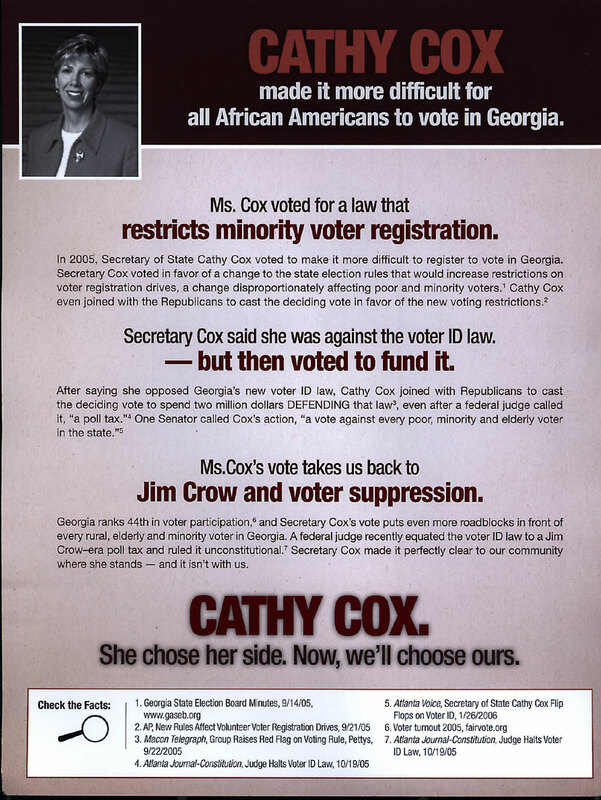 The mailer blatantly disregards Cathy Cox’s consistent strong voting record on civil rights and voting rights. She has always opposed the Photo ID bill, and just recently twisted the arm of the current Republican administration to get the data to prove that hundreds of thousands of Georgians risk disenfranchisement this year if the law is enforced. Just yesterday, the very same day this mailer hit, she again gave testimony in federal court in front of Judge Murphy. Based on the evidence he heard, Judge Murphy ruled that the Voter ID Law could not be enforced for this election. Where was Mark Taylor? Rehearsing for the debate? Based on Cathy Cox’s efforts to insure that voter’s social security numbers did not randomly fall into the hands identity thieves and her vote to require this Republican administration to pay its own legal fees to defend the ill-advised bill, the Taylor Team accuses her of attempting to suppress the vote. What a stretch. 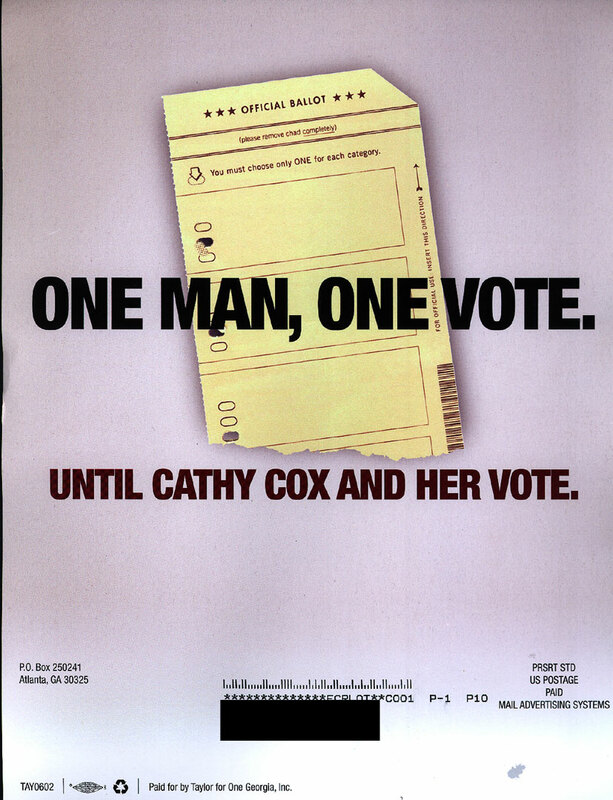 The truth (something with which the Taylor team seems increasingly unfamiliar) is that of the two candidates, Cathy Cox is the only one who has consistently fought the draconian Voter ID Laws. Taylor failed to lead early on. Consider this history.The Photo ID bill was first proposed several years ago by former Senator Joe Burton. At the time Mark Taylor was a Senator and had control of the Georgia State Senate, and he allowed this bill to move right on through. Cox was in the House and worked tirelessly to stop the bill and fortunately she succeeded. Cathy Cox has been on the right side of this fight since day one. Mark Taylor is the one who was late to the party, and it is Mark Taylor who cozies up to a lawyer who fought federal desegregation orders and who himself recently said that when it comes to whether to consider race as a factor in drawing school district lines that it should be up to “local school boards” to decide. Yet, when he’s called on his inconsistent positions, he and his supporters cry fowl and he plays the victim. I guess Big Guys just can’t be held accountable in the same way the rest of us can. 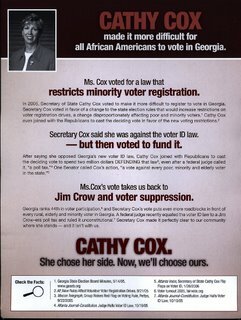 For the record, I didn't like the piece attributed to Cox yesterday either, but when it comes to playing the race card, it pales in comparison to this expensive, long-planned mailing. This kind of high quality printing does not appear overnight. But garbage is garbage no matter what it's printed on. I have just two questions: Does Mark Taylor have any regard for the truth? And why do he and his supporters think that there is one set of rules for Big Guys and another set of rules for everyone else? Read my comment from yesterday. Lee Parks was fighting the Voter ID Bill in the courts. His name is right there on the pleadings. Check it out on the GA Supreme Court website. (I offered a link in yesterday's comment). I will admit I don't like that mailer either. However, today CC upped her flagger piece a notch. Go over to Andre and check out the "Taylor Plantation" piece. Disgusting. Also, when watching a video on You Tube this morning, I was reminded of CC's paternalistic (maternalistic?) view of minority students. Remember how amazed she was? "EVEN though the school is X% minority..."
...and the recent CC mailer that did the same means nothing to you guys huh? I almost forgot. Congrats to MT for getting the AJC endorsement! The AJC agrees that Mark has the deeper understanding of the issues, "Her [CC] knowledge of the challenges facing Georgia is thus less detailed than that of Taylor , and her political skills less well-honed." Hey, MT wasn't at the trial because he wasn't summoned. I guess ignoring the facts and creating different conditions for MT is all y'all care about. The truth is (and I know this is a foreign concept to CC supporters) you can't be a senator and control the senate. But more importantly...they're democrats for god's sake! They are not the old style (racist) Dems. Both camps stop trying to assert as much. It makes both of you look assinine and petty. Jesus, this blog and GAUnfiltered have sunk to new lows. The two of you sound worse than children. Grow up. oh and as a big guy, I dont think there is one set of rules for big guys and one for everyone else. Grow a brain and have some sense if thats possible. Amy, I don't think anything Taylor said in his mailer was a lie. She did vote to fund the Voter ID. It was 2-2 and she cast the tie breaker and sided with the Republicans. She also tried to make it harder for those who participate in voter registration drives. 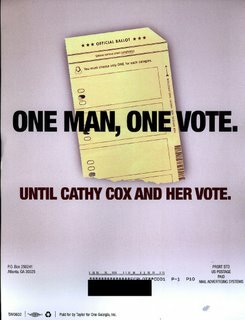 I think Cox supporters are blinded. She is not even a real democrat. She's NOT EVEN PRO-CHOICE!!! As a woman, I would vote for a male that stands up for my rights other than a woman who doesn't stand up for anything. You're dead wrong, Jo. I can't believe that you would stoop so low. You know as well as I do that Cathy is pro-choice. She is WIN endorsed. I am on that board, and being pro-choice is an endorsemment criteria. I expect as much from the Taylor Campaign. First off, I am hardly the Taylor campaign, and I got that from a big legislative supporter of hers in the House. I asked isn't Cathy Cox pro-life? And she said that she was pro-life, but she would never do anything like support the women's right to know act. I said okay, but given the way she pandered to the gay community and then turned her back on them it makes me wonder. Oh and by the way, shame on you, I am not a liar, and if I wasn't told PERSONALLY I would have never assumed so. Do you believe everything you're told Jo? Name your source. Why would a stong Cox supporter and a legislator lie about her position? You don't seem that surprised either. Maybe you knew already. And you know I would out my source if I could, but I am telling the truth. Let's try the spelling again. Of course, Jo. Don't fret. We believe everything you say because you have never done anything to call your credibility into question. I haven't. And Mrs. Morton, I will be more than happy to tell you in person, but I will not say it publically on the blog. The context of the conversation was personal, so pick your time and place. I wouldn't want a WIN person voting for a Cox believing she was pro-choice. Good grief! I will be glad when the primary is over! I agree with Lyman. What is up with Cox's flagger nonsense? Are we totally ignoring this crap? Isn't it interesting how "Paid for by Cox for Governor" is so tiny in a shaded area? What lame excuse are you going to give? Is it those are out of context, misrepresenting the truth, or I'm on the MT payroll? BTW I am not paid by MT. Just a passionate, grassroots supporter. I know you dont think we exist but we are hardly few in numbers.